First we head downstairs to see where all of the magic begins once they have their choice grains delivered, many of which come from an organic farm in the local Finger Lakes region. All 40 thousand gallons of whiskey made each year by Kings County Distillery are fermented, distilled, aged and bottled in this very location, It is a beautiful 19th century building…and at 5pm the light streaming through the windows and hitting the brick walls made for an even more unforgettable experience. So first up is the mashing phase in which the grain grist and water is mixed in what is almost like a giant stock pot and heated up to turn the starch into fermentable sugars. 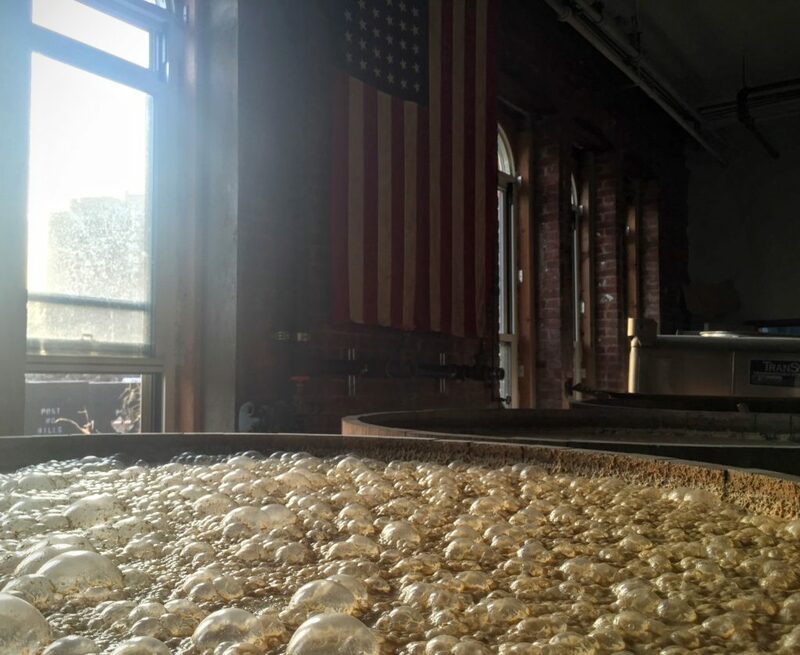 Then the liquid is strained off from the grains…this liquid is often called wort…and while the larger scale distillers often move both the wort and the grain into the next fermentation stage together, Kings County is an off-grain distiller. This means that the grain is only used in this first mashing step. After that the grain is distributed back to local farms for composting and animal feed and only the wort is moved forward into the next stage. And lucky for me, that next stage of fermentation had some rye bubbling and fermenting away right before my very eyes. With a nice touch of Americana as a backdrop, I might add! In this stage yeast is added to the wort, causing the sugars to ferment and turn into alcohol. The smell down here is amazing…almost bread-like but with a distinct undertone that lets you know something even more delicious is happening. Next, we move a few steps over to the distilling phase. The small size of this operation now helps me see that they truly are actively making whiskey 365 days a year…pretty impressive. This, I have to say is my favorite stage, simply because I’m a sucker for old-world ways with beautiful, almost antique looking equipment. 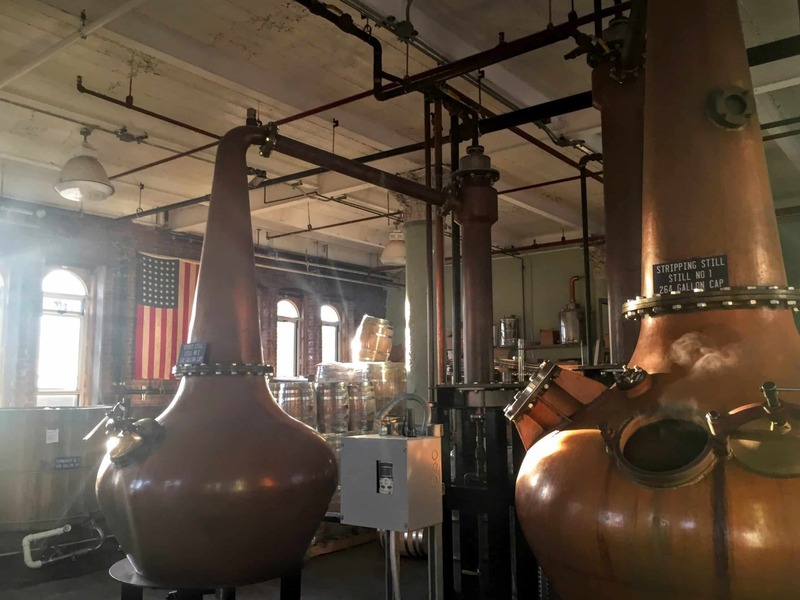 Colin Spoleman, their master distiller who was born and raised in Kentucky but actually didn’t start making moonshine until he moved to New York after college, prefers the Scottish Alembic Pot Stills that you see above. So first, there is a stripping still where the most toxic alcohols are “stripped” out of the liquid as it vaporizes (or turns into a spirit), moves up a connected pipe, is quickly cooled and then turned back into a liquid where it lands in the spirit still right next to it. 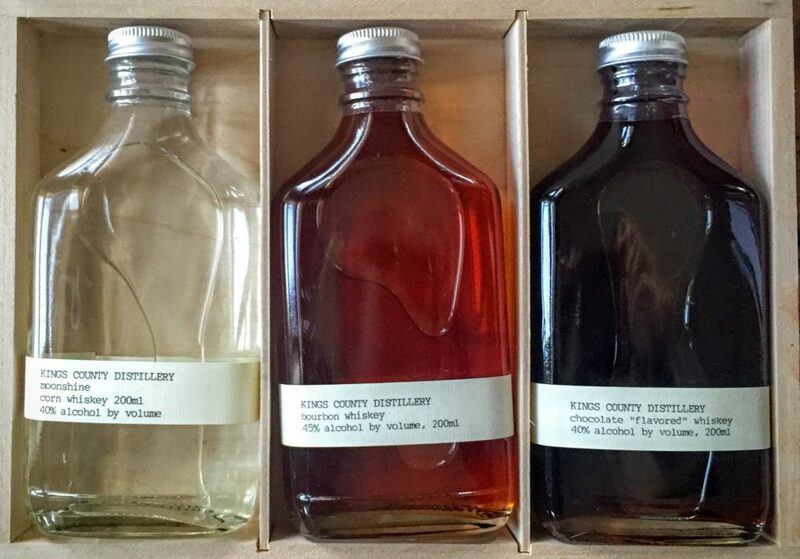 Kings County does a double distillation and works it’s way through the four fractions of the whiskey (foreshot, head, heart, tail) completely manually. No automated technology here! That means they are constantly keeping an eye on the speed that the spirit is coming out of the spirit still (one sign of which phase it’s in), checking the proof with a hydrometer (another sign), and ultimately tasting it to determine when to start and stop collecting for that particular batch of whiskey or bourbon depending on what Colin is looking to create. This whole step in the process is really fascinating and what finally comes out here is still-proof…next we move it to the barrel-proof stage! Ah, the barrel room…it was just gorgeous as you can see in the key picture of this post. The brick walls, the sunlight streaming in, the rows and rows upon barrels, the angels’ share in the air. I’m in my happy place. 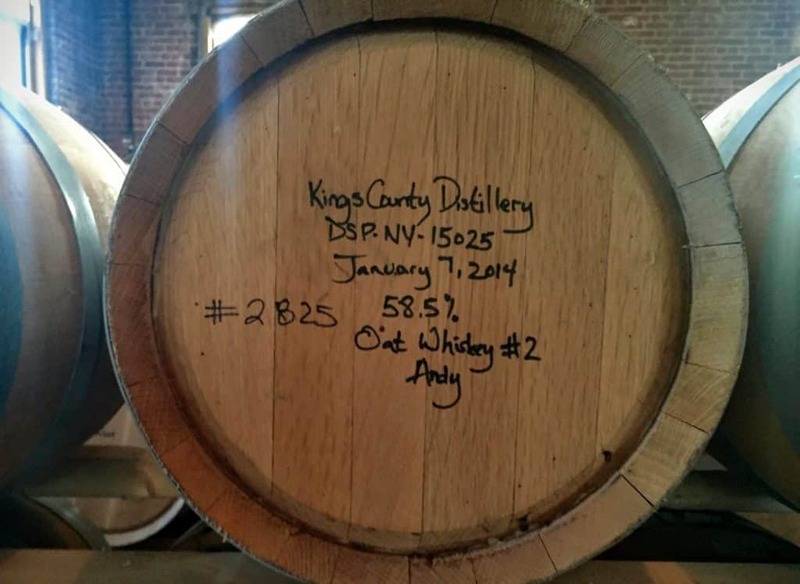 Kings County specializes in bourbon, which means they go through a lot of barrels since you can only put bourbon in an unused barrel. They also make interesting whiskies like this oat whiskey pictured here. And even with their bourbon, they are unique. Most bourbons are either corn/wheat or corn/rye mixtures but Colin’s flagship bourbon is a more rare corn/malted barley mixture…and let me tell you it’s deliciously creamy and almost buttery. I learned something new and fascinating in the barrel room…something likely very well known to super whiskey connoisseurs. I’ve been immersed in wine country for so long, so while I’m very familiar with the barrel aging process in wine I’m less familiar when it comes to whiskey and just assumed it was pretty much the same. 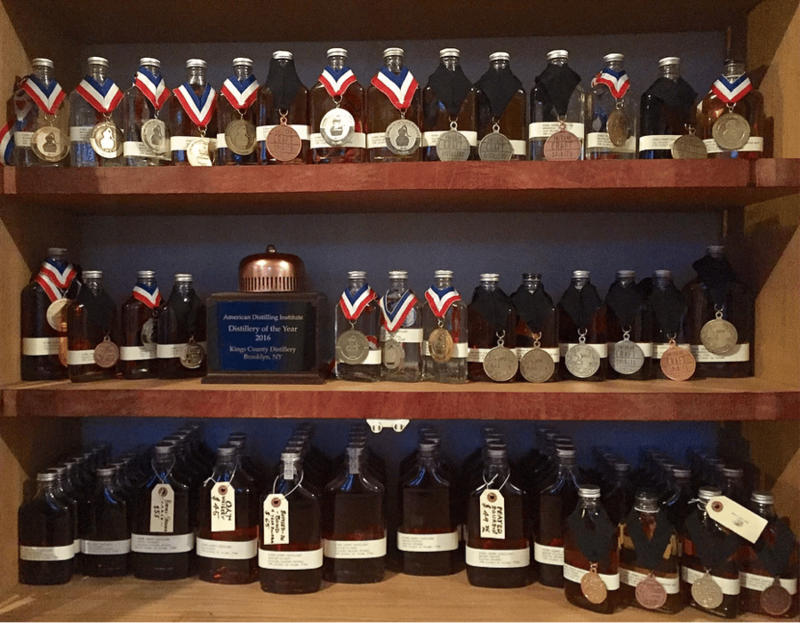 While a lot of it is, there was one big difference…the fact that there is intentionally no temperature regulation in the whiskey aging rooms. 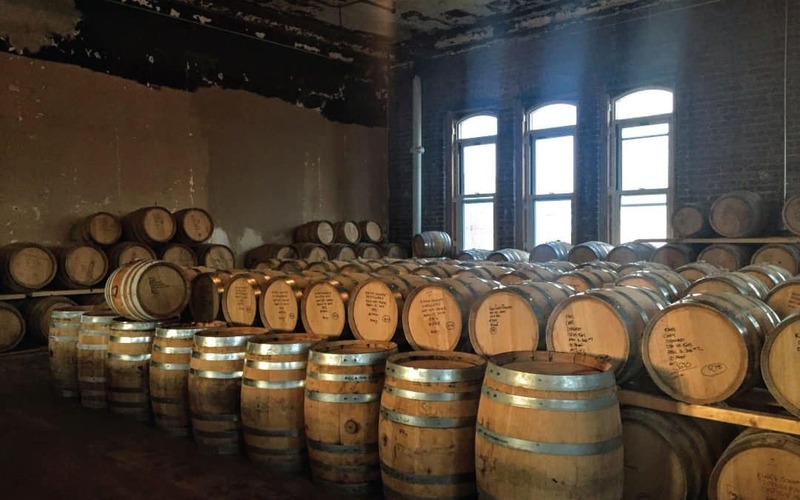 In fact, they want extreme lows of the winter and highs of the summer because as temperature fluctuates the wood in the barrel expands and constricts allowing more of the whiskey into the wood and then pushing it back out. Which imparts much more of the flavor of the wood into the spirit itself. Whereas wine is looking for a much more subtle kiss of the flavors of the wood and so therefore regulates the temperature. Fascinating! Last, but certainly not least, we head back to the tasting room where we started…the three whiskies above are their most popular, flagship whiskies that are available most broadly. As I mentioned previously their bourbon is really incredible and a bit unique in the creamy texture. The moonshine I love as well…partially because he’s calling it moonshine and resisting the trend to call it a white whiskey or something else like that. I asked a little about that and Lia told me that Colin feels passionately about elevating the reputation of moonshine, which in reality is just un-aged whiskey and where Colin started his distilling career. I honestly wasn’t expecting to like the chocolate whiskey…I tend to be pretty biased about flavor infused spirits and beers…but this was incredible and could honestly replace a port for me. They use a super dark, almost salty smelling chocolate from Mast Brothers Chocolatier, who’s head office and factory is right next door in the Navy Yards as well…it’s just so Brooklyn, I love it. I never thought I’d be into this but I’m definitely buying a bottle to have on hand for after dinner drinks! 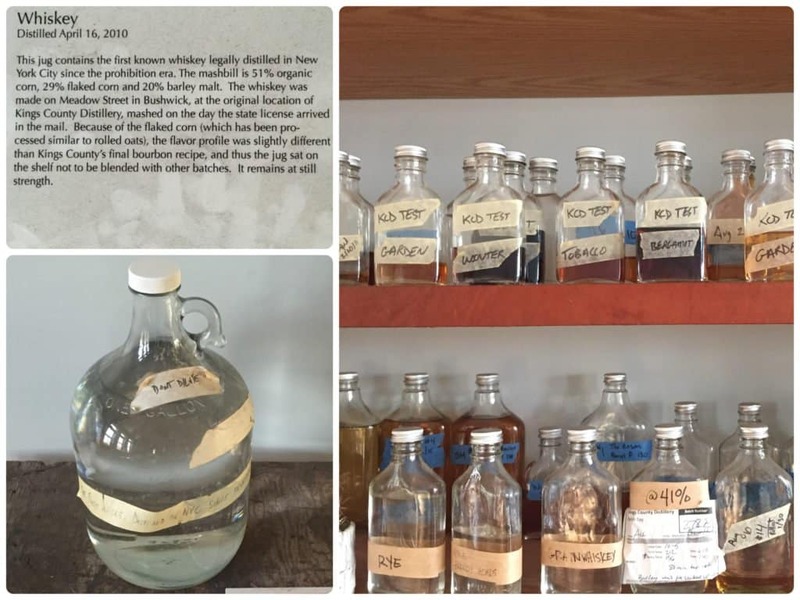 Next time you’re in Brooklyn make sure to check Kings County Distillery out…highly educational and fun tour with a great tasting at the end. Beyond that…look at all of those awards! Truly amazing whiskies and bourbons with some fun, unique seasonal ones as well. When you’re done with your tour make sure to head over to The Gatehouses on your way out of Navy Yard to taste even more of their award winning whiskies and sample some fantastic, artisan cocktails as well. My favorite was the Harlan Nog, which included their oat whiskey, a honeyshine and frothed egg whites…but don’t take my word for it, get out to Brooklyn and go try some yourself! When we discover favorite new distilleries we’re always considering them for our behind the scenes video series…is Kings County a video we should make? Leave us a comment below and tell us if this is a video you’d watch so we can gauge interest and prioritize our next big shoot! If you don’t already, makes sure to follow us on YouTube so you don’t miss any of our videos as soon as they’re launched!